Leeds United head coach Paul Heckingbottom was left to bemoan his side’s bad luck and bad defending as the woodwork twice denied the Whites in their 2-2 draw at Reading. As has been the case in many games this season United had to recover from a poor start, but Heckingbottom felt the team was the better in the second half and ultimately deserved more than the point they brought home. He said: “We worked our socks off to get back into the game and I thought that we were the better team in the second half. Heckingbottom was unhappy with the goal that gave Reading the draw after the Whites had done their own turnaround from going a goal down. “I’m aggrieved because their second goal is upsetting me. Just because initially it is from our free-kick. “We’ve got three men behind the ball and they have got none in front but as we play the ball forward our three run forward and Mo Barrow runs forwards so when the keeper eventually claims it we give him the option to go and hit us quickly on the counter. “It’s those little details that have been costing the team throughout the season and those things that we have to iron out because the players were oblivious to that and I pulled them on it after the game. “I want to begin to build a winning mentality because whatever happens this season, if we’re not in the play-offs, we want to be in them next season, so all the work starts now. Heckingbottom made six changes for the trip to Reading following Leeds’ comprehensive defeat to Wolves in midweek and his side looked to have made a decent start with Ezgjan Alioski going close twice in the first 10 minutes. But the familiar story of recent weeks saw their opponents score first. Young keeper Bailey Peacock-Farrell, who was retained in goal after his impressive display against Wolves, was beaten on 16 minutes when the Whites defence pushed up, but Matthew Pennington stayed back, playing Jon Bodvarsson onside to race through to score. As so often has been the case this season one goal could have been two soon after when Bodvarsson’s close range effort from a Mo Barrow cross was kept out by a combination of Peacock-Farrell and Pennington, who then did well to pick himself up to block George Evans’ follow-up shot. Barrow was then denied by Peacock-Farrell after taking possession from recalled left-back Laurens De Bock. As in the first against Wolves it was fast becoming the Peacock-Farrell show as he made a super fingertip save to tip George Evans’ 25-yard shot onto the crossbar. 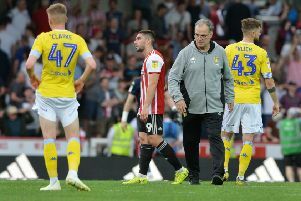 Leeds did improve before half-time, however, and were level when Adam Forshaw made a good run into the box and his pull back found Pontus Jansson who was able to steer a shot into the net for his third goal of the season . They could have been ahead at the break when Alioski went past a defender and the goalkeeper in the area only to hit the post from a tight angle. But it did become 2-1 11 minutes into the second half as Samuel Saiz found Pablo Hernandez just inside the box and he found the top scorner of the net with a great finish. Celebrations were not to last long, however, with Reading going virtually straight down the other end to equalise when Eunan O’Kane could only turn a low drive from Leandro Bacuna into his own net with Peacock-Farrell possibly having the original effort covered. United looked the more likely to grab a winner in the rest of the game and only a good save by Anssi Jaakkola denied Alioski. Jaakkola was lucky in the 87th minute when his attempted clearance bounced off substitute Pierre-Michel Lasogga and the ball rolled agonisingly along the line before hitting the post. With the that the action was done and neither side was happy to bring away a point with Reading still in relegation danger and Leeds short of mounting any sort of promotion challenge. With one win in seven matches so far Heckingbottom has not enjoyed a great start at Leeds and the team has only won once in 14 matches since Boxing Day. Next up are Sheffield Wednesday at home and with the Owls’ recent form fans will be expecting a return to winning ways. Reading: Jaakkola, Gunter, Moore, Ilori, Bacuna, Clement (Swift 63), Evans (Edwards 63), Kelly, Aluko, Barrow, Bodvarsson. Leeds: Peacock-Farrell, Berardi, Pennington, Jansson, De Bock, O’Kane, Forshaw, Alioski, Hernandez (Dallas 85), Saiz, Ekuban (Lasogga 77).